Donald Trump Jr. just traded his last scrap of plausible deniability for a few thousand retweets. After learning that the New York Times was about to publish an email exchange that would show him eagerly accepting an invitation to collude with the Kremlin, Donald the younger decided to preemptively confirm the emails’ veracity, and post the messages to Twitter. It is unclear whether Trump Jr. ran this strategy by anyone (perhaps, a very bad lawyer or very myopic social-media manager?). Regardless, it does the Trump Organization executive few favors. The messages document a June 2016 exchange between Trump Jr. and Rob Goldstone, an acquaintance and music publicist who represents Russian pop star Emin Agalarov – son of billionaire Russian real-estate developer Aras Agalarov. “If it’s what you say I love it especially later in the summer,” Trump Jr. replies. He would later take a meeting with the Kremlin-connected lawyer Natalia Veselnitskaya on the promise of such tantalizing dirt. So, these emails suggest that Trump Jr. was more than happy to welcome the Kremlin’s help, and was either bizarrely blasé about the revelation that the Russian government supported his father, or else already aware of Putin’s intention to aid Trump’s candidacy in June 2016. They also establish that Donald Jr. is not the brightest bulb in Trump Tower. But what these emails reveal about the Trump Organization’s top nepotism hire is of less immediate concern than what they say about the White House’s — namely, Jared Kushner. Trump Jr. didn’t attend the Veselnitskaya meeting alone. He brought along his brother-in-law and then–Trump campaign manager Paul Manafort. And when Trump Jr. forfeited his ability to claim ignorance of that meeting’s true nature Tuesday, he forfeited Kushner’s as well: The emails he posted show that he forwarded his entire email chain with Goldstone to the now-senior White House adviser. Which is to say: One of the president’s most powerful advisers — a man who has played such an active role in shaping the administration’s foreign policy, he’s been called the “second secretary of State” — knowingly met with an agent of the Kremlin in hopes of securing opposition research on Hillary Clinton. Shortly after Trump’s election, Kushner spoke with the Russian ambassador about setting up a secret communications channel with Moscow — one safe from the prying eyes of American intelligence agencies. Days later, Kushner met with the head of the Russian state-owned bank Vnesheconombank — an encounter that he described as diplomatic, but that the Russian banker insisted was strictly business. 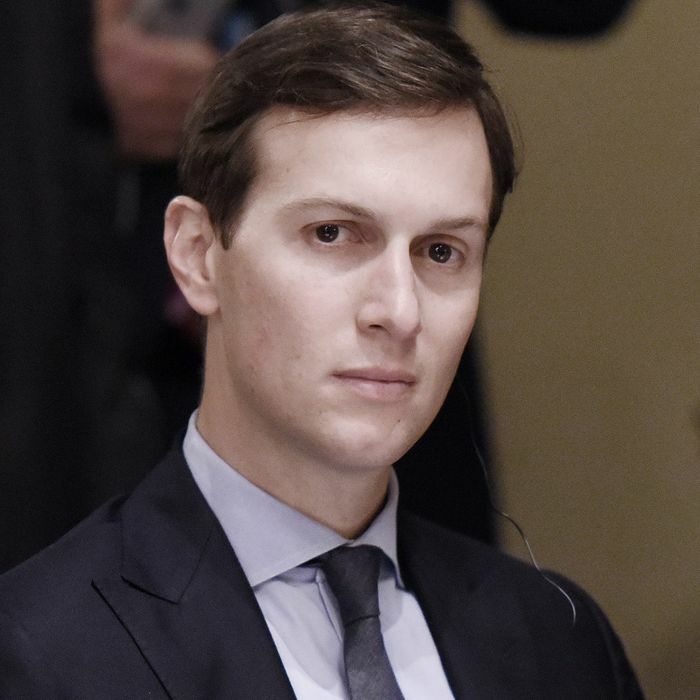 Later, when asked to list any meetings he’d taken with foreign government officials on his application for a top-secret security clearance, all of these incidents slipped Kushner’s mind. When Trump Jr. surrendered Kushner’s plausible deniability, he also forfeited the congressional GOP’s. Capitol Hill Republicans still have a few outs when dealing with the Russia scandal: The president himself still hasn’t been irrefutably implicated, and “we need to let the investigations run their course” remains a useful dodge to many questions about the Russia story’s implications. But every Republican in Washington now knows that a senior White House adviser, who has access to our nation’s most closely guarded secrets, was willing to participate in Russian interference in an American election and then knowingly misled the government about it. The least congressional Republicans can do now is to demand that Trump treat his son-in-law to his signature catchphrase. There was never a good argument for why a 36-year-old real-estate investor — who made a $1.8 billion bet on the health of the housing market in 2007 — should dictate America’s policy on Israel-Palestine, reforming the federal bureaucracy, or the opioid epidemic. But surely, a trust-fund dilettante with no policy-making experience and massive potential conflicts of interest — who has made a habit of secretly conspiring with Kremlin agents – should not have top-secret security clearance.